Easy glazed carrots recipe with pomegranate juice and cinnamon. 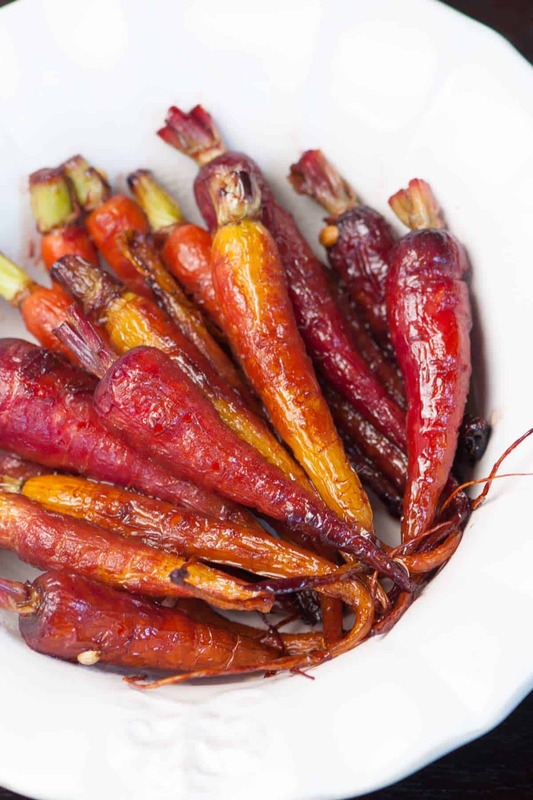 Jump to the Easy Pomegranate Glazed Carrots Recipe or read on to see our tips for making them. We are in serious withdrawal. It was only five days ago that our plane touched down at after a trip to Paris. Things were buttery, perfectly flaky, brewed properly and poured generously. Wow, did we have a wonderful time. As we try to get back into the swing of non-buttery things at home, we made these carrots with a twist – pomegranate! The pomegranate glaze is tart, but against the sweetness of the carrots, works so well. They take just under 45 minutes to prepare and are striking and beautiful when served. They were perfect hot, but even better at room temperature. Give these a try the next time you have carrots in the house, you’ll love them. 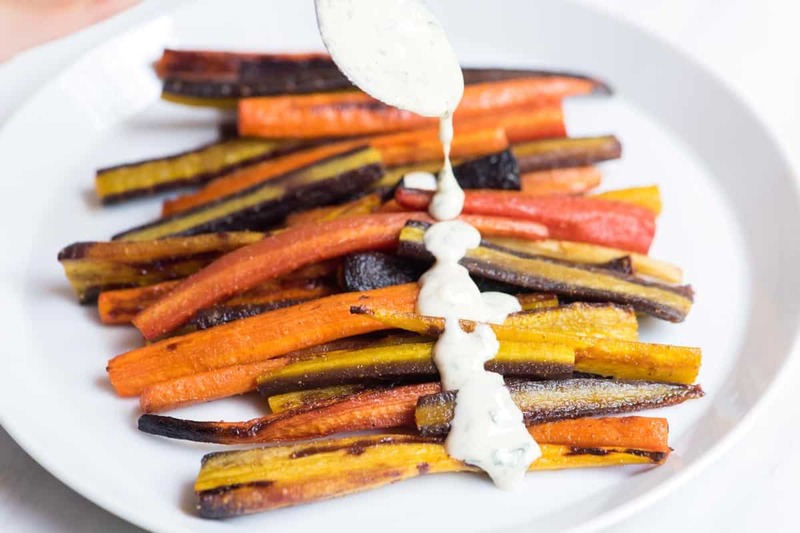 YOU MAY ALSO LIKE: A quick and simple recipe for roasted carrots with honey, spice and the most delicious tahini sauce drizzled on top. 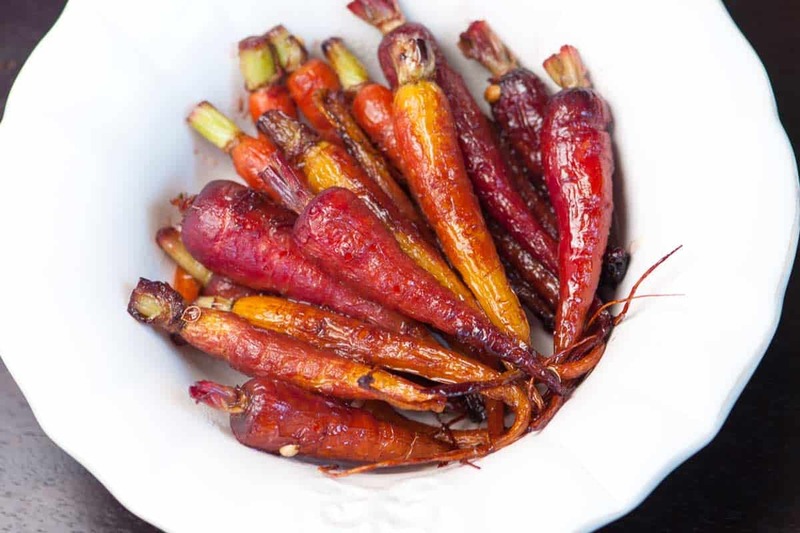 Jump to the Roasted Carrots Recipe. The pomegranate juice adds a little tartness to sweet tender carrots. We love these served hot and at room temperature. 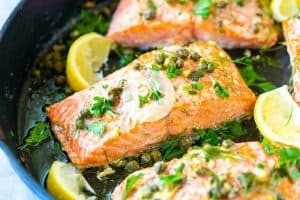 Heat the olive oil over moderately high heat in a wide skillet or cast iron pan. Toss in the carrots and cook for 5 minutes. Add the pomegranate juice, cinnamon stick, salt and pepper then simmer, uncovered, stirring occasionally until the carrots are tender and the liquid has reduced down to a glaze; about 20 minutes. Remove the pan from the heat and swirl in the butter until melted. Discard the cinnamon stick and serve. If after cooking you find the carrots to be too tart, add a small drizzle of honey and swirl it into the butter sauce. Sheila, thanks! The pomegranate really adds a nice touch to the carrots – a little sweet, but a touch tart. Hope you enjoy! I couldn’t wait to try this simple recipe. I liked it, but did find it too tart. In order to cut the tartness, I added a shot of creme de cassis and let simmer 5 more minutes. It did not mask any of the other flavors, just took out the tartness. 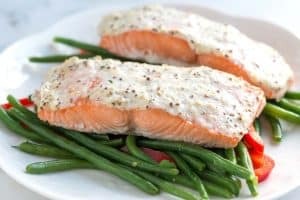 Perhaps you will want to experiment with a small amount rather than risk spoiling a delightful dish, but I think that you will agree that it enhances the dish. Cathy, We love the idea of using creme de cassis, we can imagine it would be lovely. We agree that the carrots can be a bit tart – the carrots shown in this picture were very small and sweet carrots, adding extra natural sweetness. Another way to add a touch of sweetness to the dish for balance could be a dash of agave nectar, sugar or even honey. Plus, the level of tartness could also be related to the brand of pomegranate juice you use. Wow, what a fresh approach to carrots! I will definitely try those out. I love all the different colors…beautiful dish! These carrots are gorgeous! I love all the sweet spices and the use of pomengrante juice here is brilliant! 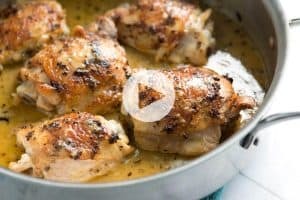 I love this recipe….will definitely try it! Looks delicious. Lovely pictures also! Paris, how wonderful! 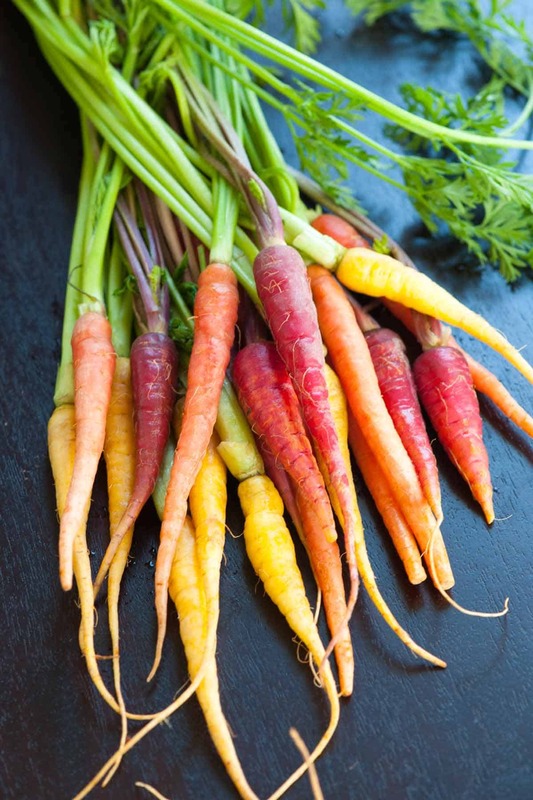 These carrots are quite lovely to look at, but are probaly delicious to eat! The pomegranate would add a unquie taste , very nice recipe. Really gorgeous. I love simple recipes that highlight a veggie’s natural taste. I can’t wait to try this. Thanks. Thank you ladies .. the pomegranate glaze is really quite delicious against the sweetness of the carrots. These carrots look lovely. I cannot wait to hear about your trip. Mmm your carrots look delicious! I will so have to try this. Those carrots look incroyable. Sadly, incroyable is about the only word that I remember from four years of french class. Hope you’ll post more about the trip.